What I remember loving about working with acrylics was how saturated the paint was. I love vivid and interesting colors and acrylic painting is all about that. You can leave acrylics thick and very textured, or you can add water and thin them out, similar to watercolors. 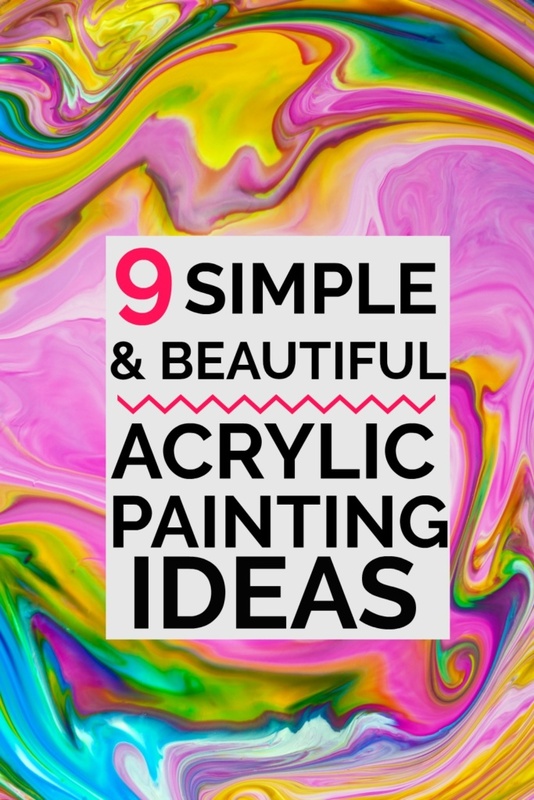 As you’ll see below there are many different techniques to use for your acrylic painting ideas. What Do you Need for Acrylic Paintings? Before we get to the oh-so-pretty paintings, I wanted to touch really quickly on what you need for acrylic painting. You’re going to need some paint. 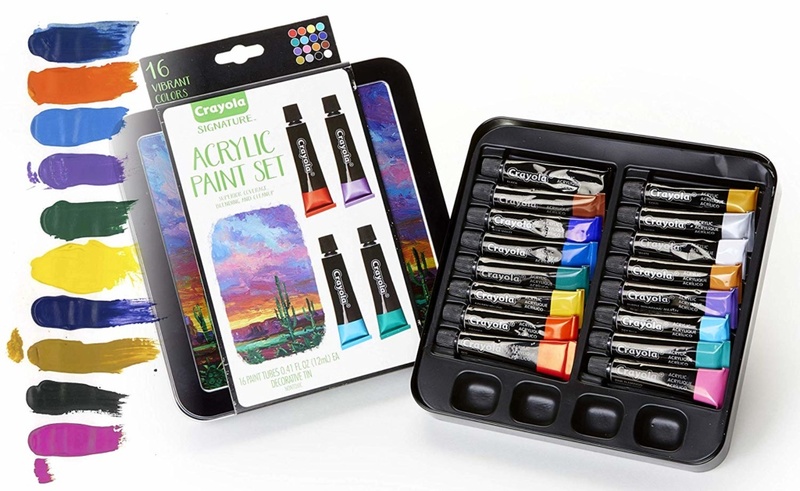 To start, something like this Crayola Acrylic Paint set is recommended. It’s not super expensive and it will get you started as a beginner. 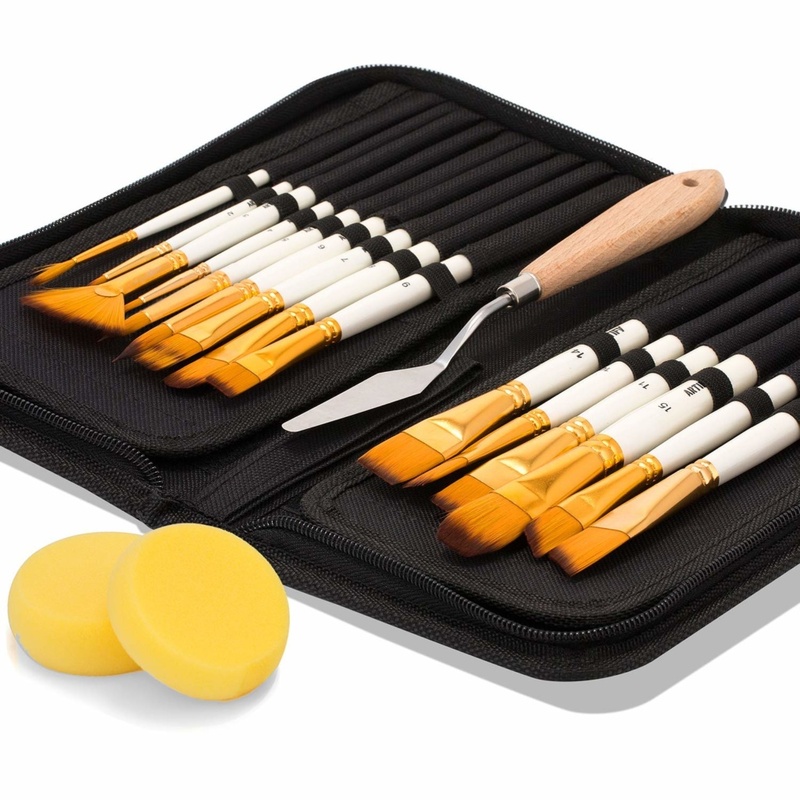 You’re also going to need some brushes and also a palette knife is helpful to have. The palette knife is used for mixing and you can even use it to paint an entire painting, as you’ll see in one of the tutorials below. A palette is a helpful, too, although I’ve seen a paper plate work nearly as well. Then, of course there are canvases and/or paper. I love this paper from Canson. I use it for my watercolor paintings, but it is heavy enough for acrylics, too. And that should do it for the most part! On to the Tutorials! This pretty floral painting from The Cheerful Space is really lovely. I love the colors. I love the abstract flowers. The step by step tuturial for this painting looks very doable. I also found it interesting that this is on paper, not canvas. That makes this painting much more affordable. Acrylics can be pricey, so replacing a canvas with some quality watercolor paper is a great way to keep your costs down. This one is definitely going on my “try it” list. Youtube is a great source for learning all kinds of different things. I have two of my painting tutorials up on Youtube and I can’t wait to add more. This acrylic painting idea from Katie Jobling is a great way to learn to paint some beautiful roses. It’s one that looks like it has to take a lot of skill, but Katie says it’s easy and a great way for a beginner to start. It’s mesmerizing to watch the roses start to form on the page. If you haven’t stumbled upon Acrylic Pouring yet, then I’m happy to be the first to introduce this to you. It’s an amazing acrylic painting technique. 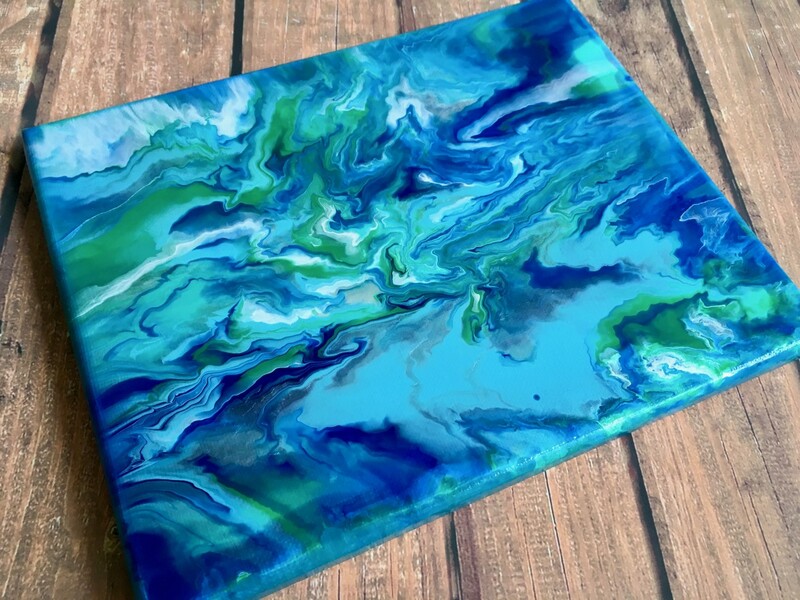 This Acrylic Pour Painting from Felt Magnet is an excellent example. It’s completely gorgreous. The colors are amazing. I love the marbled/abstract look. This is the acrylic technique I will be trying first. Supplies are ordered. I’m hoping to have my first one posted next week! I’m really excited about this, if you can’t already tell! I have to admit this pear is so realistic looking to me, that it kind of makes me feel like I couldn’t possibly be ready to paint it. But it’s a great tutorial from Ashley Picanco. The video is long and detailed and a great resource for beginning painters. I know I said in the beginning how much I love vibrant colors, but second to that, I love things that are dark and moody. This Rainy Day Painting from Painting with Jane is exactly that. It’s another long and very detailed tutorial. I love that Jane shows how she plans in where and what she’s painting in chalk. I actually loved the almost halfway point of this tutorial when it was just a dark abstract landscape painting. If you’re into a laid back beachy vibe, this tutorial from Flower Patch Farmhouse might be perfect for you. It reminds me very much of Cape Cod, actually. This would be so cute on your mantel as summer starts to approach! I mean, it’s February as I’m writing this, but, summer is technically approaching, regardless of what the snow outside my window thinks. I can’t get enough of these youtube tutorials. It’s definitely helpful to see the artist in action! Ok, if you want a really easy, really quick acrylic painting idea, then this tutorial from Birch and Button is for you. I love a pretty abstract painting with lots of color and these are exactly that. 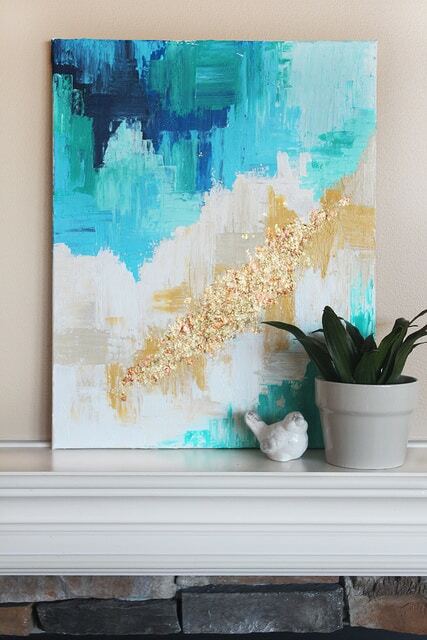 If you can hold a brush, you can totally make this painting. I love that this is another painting on paper, too. I want to try as many of these as I can, but I also don’t want to go broke! Once you’ve mastered the tutorial from Birch and Button, this gorgeous abstract from Lolly Jane should be next on your list. I love the colors here and I really love that dash of glittery gold. It really puts this one over the top. The texture on this one is great, too. 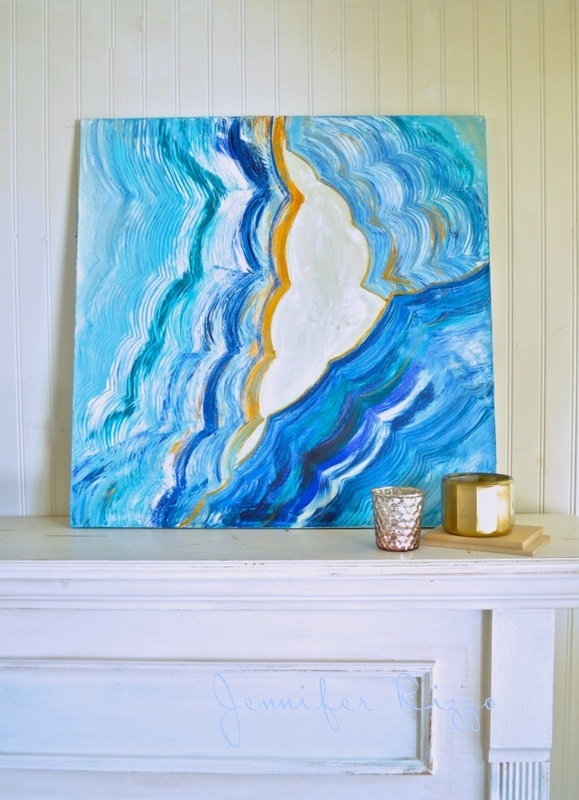 I had to include this neat tutorial for a DIY agate painting from Jennifer Rizzo. Why you ask? Well there’s a trick to it that you will just love! I love unconventional tools and methods and this one has that. And, plus, I love blue, in case you haven’t figured that out already. So, there’s a bunch of inspiration for you to get started on an acrylic painting journey! I’m so excited for my supplies to arrive this week and to get started on an acrylic pour! What was your favorite? What are you dying to try? What have you made that I didn’t mention here? Let me know in the comments!